Maintaining eye health is a major concern as we age. As we get older our eyes become vulnerable to a variety of insults that can cause irritation, dry eye, and structural problems. Applying lubricating eye drops several times a day can alleviate eye discomfort. Life Extension’s Brite Eyes III formula provides the best daily eye drop without irritation. 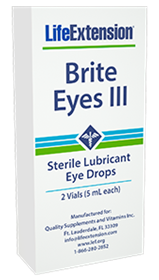 Brite Eyes III contains two proven lubricants (hydroxypropylmethylcellulose and glycerin) that are FDA-approved for ophthalmic use. It also contains the antioxidant called n-acetyl-carnosine, which helps protect the active ingredients against glycation. Each box of Brite Eyes III contains two individual vials that provide five milliliters each. This type of packaging in two individual vials reduces the risk of bacterial contamination. And, having two vials also makes it convenient for consumers to keep Brite Eyes III readily accessible at home, the office, one’s purse, pocket, or other places where access to a soothing eye drop is needed. Inactive ingredients: boric acid, citric acid, N-acetyl-carnosine, potassium bicarbonate, purified benzyl alcohol, and sterile water.